What are you going to do with your extra 24 hours this year? This abstract piece I created was done on a 5×7″ sheet of 140 lb. 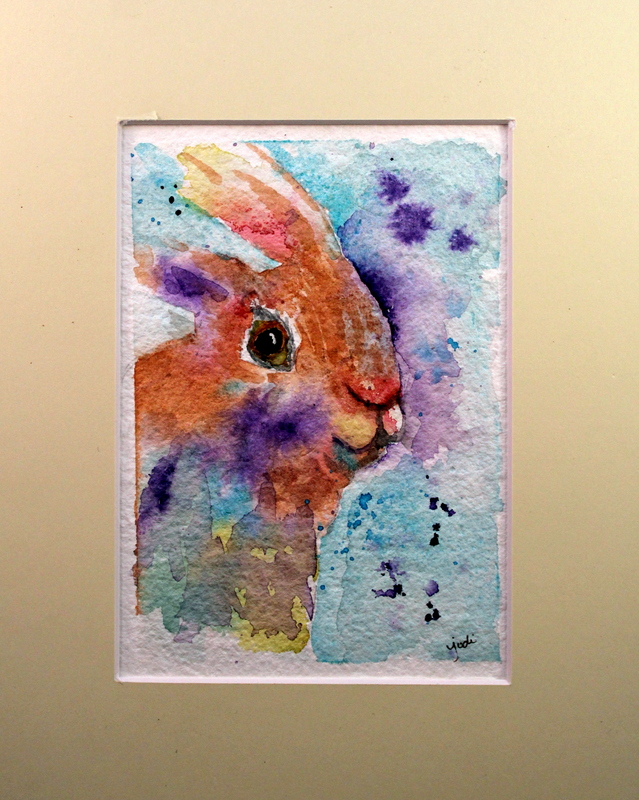 cold press shizen professional grade rough texture rag watercolor paper that is 100% recyled from post consumer waste. I love the texture of it and bought a package of 100 sheets through Blick. I’m curious to know if others have tried it. I typically use Arches, but am loving this paper. I began by slathering on some Inka Gold acrylic paint with a palette knife leaving it thicker and lumpier in some places. After it dried, I added some cobalt teal blue watercolor to one side and then mixed a bit of lemon yellow into it for the green on the other side. Before it dried, I placed a crinkled up piece of saran wrap on it, which I did not remove until the paint dried. It is really beautiful in person, and I am even making card prints from it for our ETSY Shop. I had never cooked anything with fresh fennel before and really wanted to try. I picked one up at the grocery store having no clue what I was going to do with it. The other night, when trying to decide what vegetable I was going to serve with dinner and knowing I still had this fennel bulb in the fridge along with a fresh head of cauliflower, I decided to “google” and see if there was a recipe combining the two. I came upon this one, and oh what a winner it is! This would be a lovely vegetable to serve for company, take to a potluck, or just enjoy for dinner. The fennel (which smells like anise and is kind of licoricey) is mild, yet full-flavored and holds up nicely in the dish. Don’t be afraid to try it, even if you say you don’t like licorice. It is a lovely vegetable that I’m looking forward to using again in other dishes – cooked and raw. 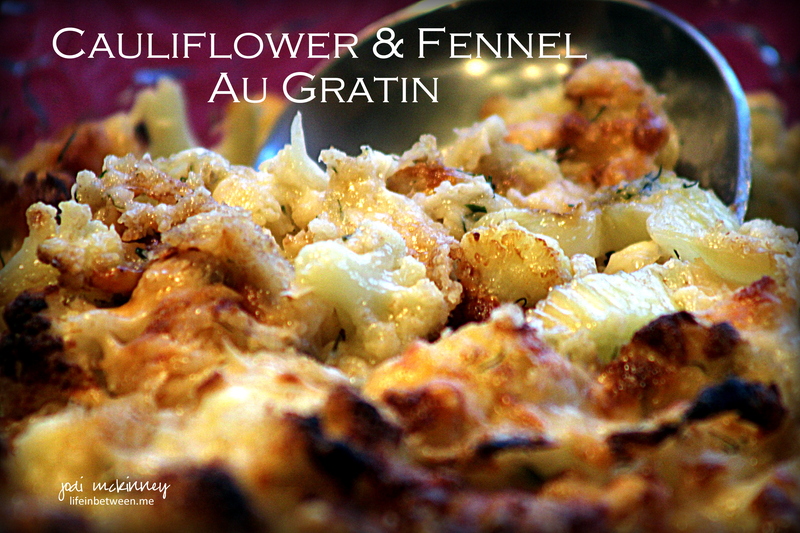 I’m sure you could make this with just the cauliflower too, but I loved what the fennel added to it. And just a pinch of freshly grated nutmeg made it really sing. I hope you’ll give it a try. Enjoy! 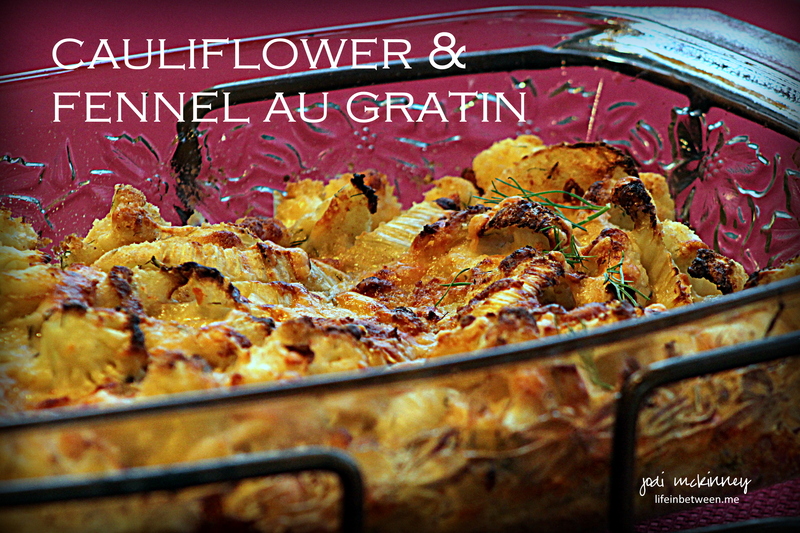 Preheat oven to 450º F. Melt butter in a large skillet over medium-high heat; add cauliflower, and sauté 4 min. Add fennel slices, and sauté 4-5 more min. or until tender. Remove from heat. Sprinkle with flour, salt, and nutmeg; add fennel fronds, and lightly toss together. Spoon into a prepared 2-quart baking dish. Pour cream over mixture. Sprinkle with Swiss cheese, bread crumbs, and Parmesan cheese. Bake at 450º for 20 minutes or until top is browned and crispy. 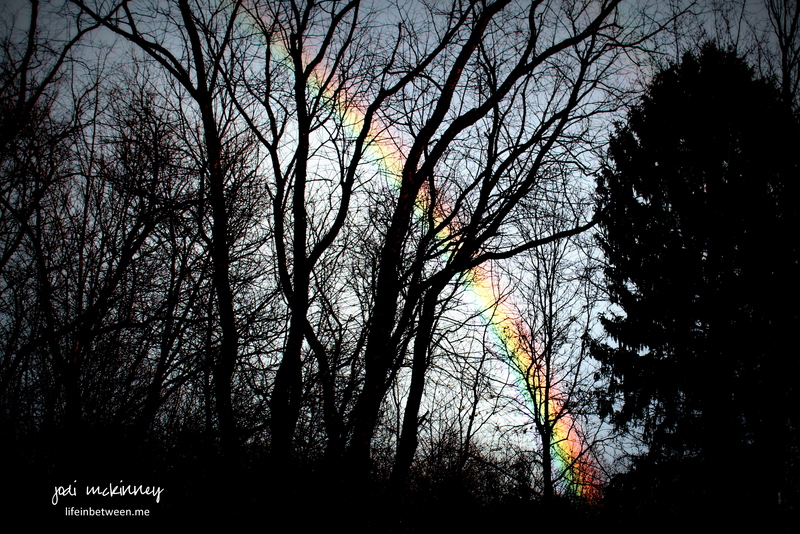 and ended with the brightest, most colorful rainbow. Right in our very own back yard. amidst the moss and twigs and fallen leaves. dancing and celebrating with the leprechauns. It is the Season of Magic. Do you every just get a “hankering” for something? Something you don’t usually have, but you just get stuck in your mind that you really, really, really want?! That’s how I was feeling this past week about chocolate cake. And chocolate cake is not something I usually make/eat/crave. But – there was no getting it out of my head, so what’s a girl to do?! Bake cake! 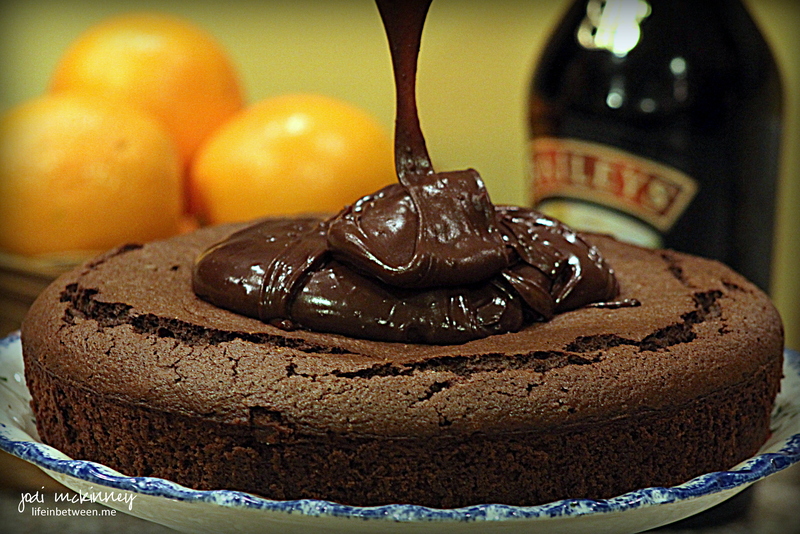 And when I found this recipe for a “boozy” chocolate cake – well – even better! But dang, it was in metric measurements, and try as I could to search for it in U.S. equivalents, no luck. So I postponed doing it the first day I thought of it, but then just bit the bullet the next day and converted it myself. I’m not sure if I converted exactly or correctly, but it turned out absolutely amazing! Oh Dear Me! This is a real treat for the hankering! 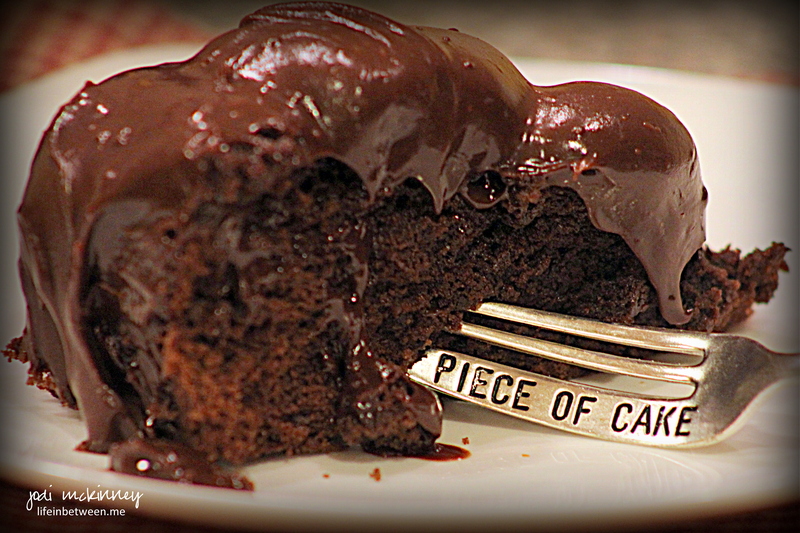 It is rich and dense and chocolately and smothered in a decadent Bailey’s chocolate ganache! I only needed a few bites to satisfy. So here it is – the Bailey’s Irish Cream Chocolate Mud Cake – converted for us U.S. bakers and also in Metric equivalents. 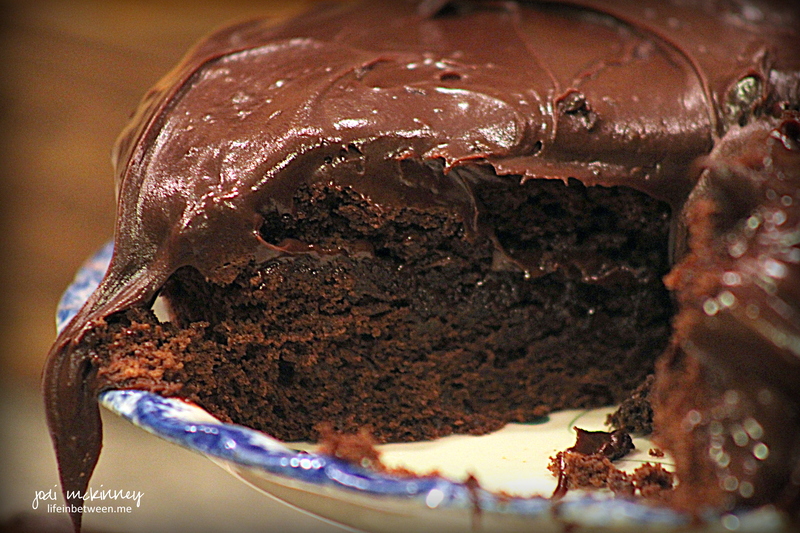 Are you craving chocolate cake yet?! Grab that bottle of Bailey’s and get baking! Preheat oven to 325° F (160°C). In a pan over low heat, melt the butter, chocolate, sugars, cocoa powder and Baileys. When chocolate and butter has melted, whisk together to combine making sure to get rid of any lumps of sugar or cocoa powder. Remove from heat and leave cool for 5 minutes. 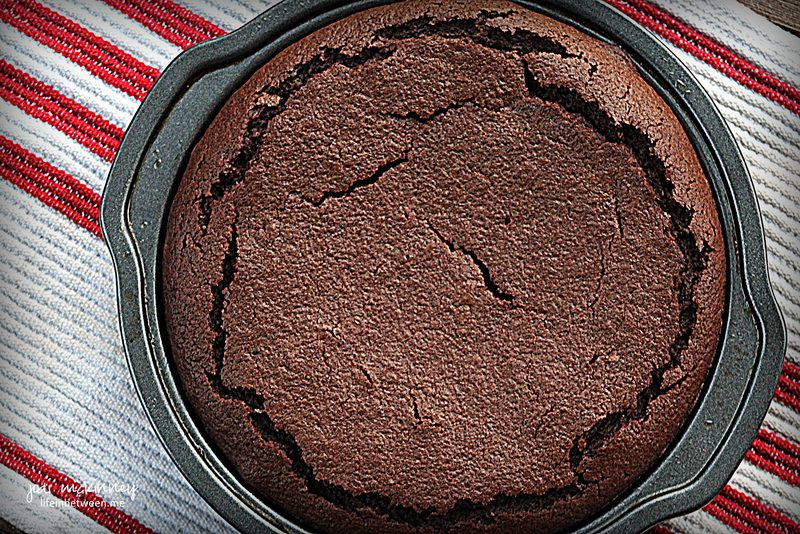 Meanwhile, grease and line an 8″ (20-21cm) round cake pan. Mix together the flour, baking powder, baking soda and salt and set aside. Add the eggs to the slightly cooled chocolate mixture and whisk to combine. Gently fold in the sifted flour mix until free of lumps. Scrape into cake pan and bake for about 25-30 minutes or until a skewer comes out clean (Be cautious, however, as this is one cake you don’t want to over-bake so better to be a little under than over). The top of the cake will have some beautiful cracks. This is normal for a mud cake, and you will be covering it with a lovely and oh so concealing ganache anyway! Remove cake from oven and cool in pan for 10 minutes before removing and cooling completely on wire rack. To make the ganache, heat the Bailey’s and the salt to a simmer in a pan (be careful to not get the heat too high and catch the alcohol on fire like I did!). Remove from heat and add the chocolate. Stir until completely incorporated, and then stir in the butter. Set aside at room temperature and cool until it is thick enough to spread over your cooled cake (or if you are as impatient as me, put in the freezer to cool more quickly). Gently stir the ganache occasionally as it cools to keep the temperature even and the ganache smooth. 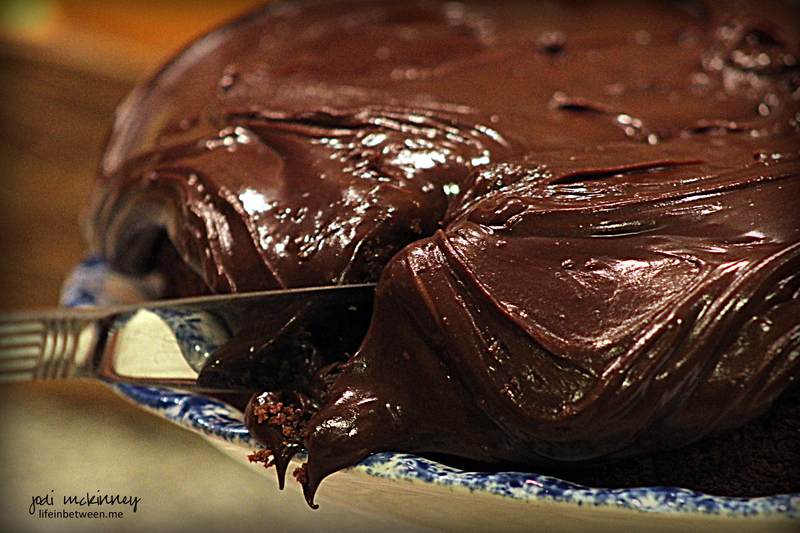 When it is cooled and thickened, spread the ganache on the top of your cake and let it drip down the sides. I’m usually a pretty laid back, easy-going kinda guy. But yesterday, I couldn’t take it any more. Mom was busy with her job. I don’t know what she does all day. Seems she just stares at the screen of that computer thing or furiously taps on the keys or is talking to other voices through it. Sure seems rather boring to me. But I put up with it. playing donut (I especially like to squeak it loud when she is on what she calls a “conference call.” If I do it enough, she give me a bone, because then I am much quieter. 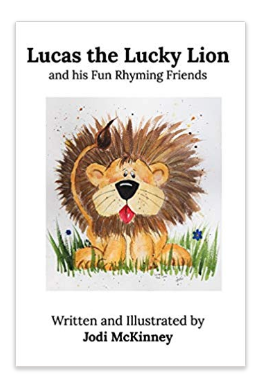 Ha ha – who is the winner there?! Don’t you agree that is a much better day than looking at a computer?! One of the highlights of my day, though, is an afternoon walk. Mom and I usually do that around what she calls “lunch” time. She gets to eat AGAIN during the day for lunch. I only get breakfast and dinner. What is with that??!! But – if I get a walk, I am pretty happy. And besides, I almost always find things on the ground to eat along the way! I licked her bare foot. I jumped in her lap! Aha! Now I have your attention lady! She laughed and told me to be patient and wait a few more minutes. So I waited… for what seemed like an eternity (about 20 seconds), and then I just had to do it…. I rarely bark. No need for such noisy jabber, but sometimes…..
You just have to bark. Mom laughed. She really did need a break. And we went for a walk. 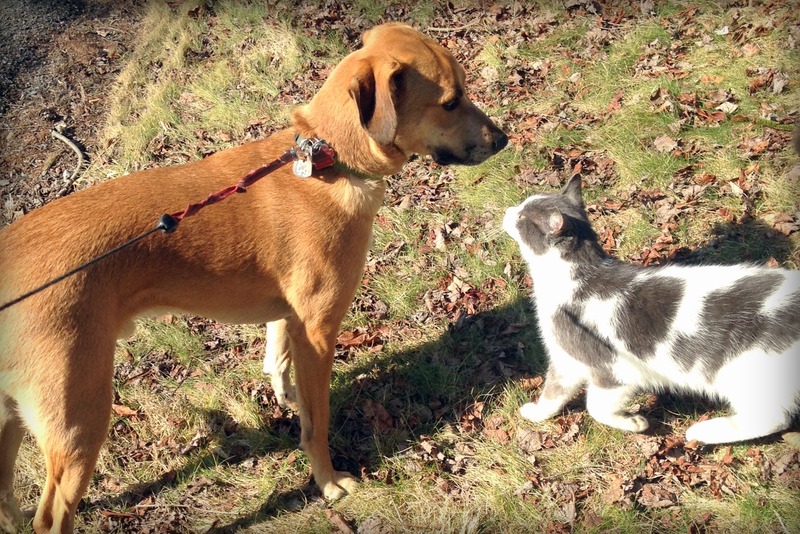 And I got to tell Kitty all about how the barking worked. Kitty is going to see if barking works at Kitty’s house too. As I was contemplating what I wanted to write for my blog post today, I was feeling very reflective. It’s hard to believe that I have been sharing a post every day for the past year and three quarters. Since there are A few more of you that visit here today than did on May 18, 2014, I thought I would share my first post again. but if I am being really honest…. I have to admit I care about what you want to hear, see, read. We’ve kind of become friends along the way. As I was reading through my first post, I reminisced…..
Jackie, my sweet “almost” daughter, who really encouraged me to start this blog will be having a baby very soon. We are looking forward to welcoming Baby Ben into our McHendy family. 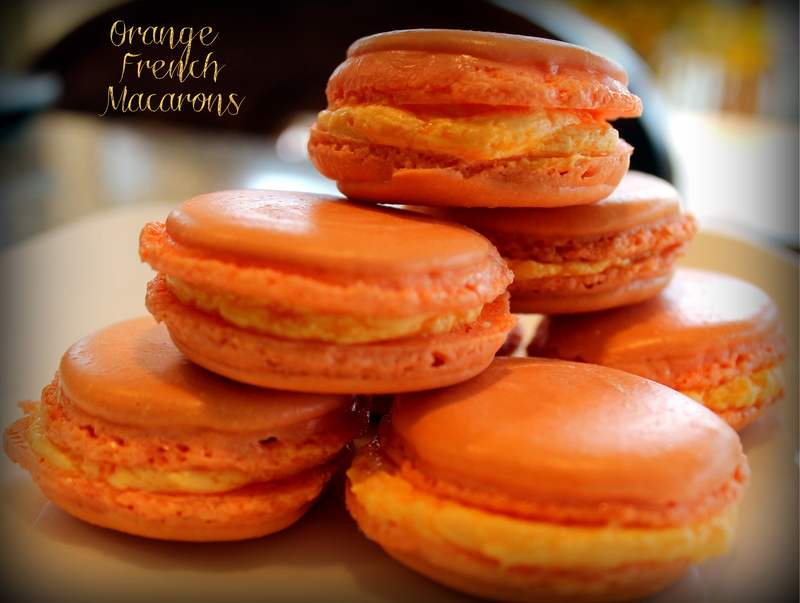 I still love to bake and cook (though I have never tried french macaroons again). I have shared many recipes along the way, and it has been fun to hear from many of you that have tried the recipes and enjoyed. Sharing my home is still one of my greatest joys. After all, it is the thing I love best about my home – the people I share it with. My “crafting” phase of late has evolved into watercolor painting (remember my very first ever watercolor – April 4, 2015?!). So many of you have been so encouraging and supportive. I am having so much fun with my daughter-in-law, Colleen, as we create our new McKinneyx2Design business, and I am so grateful to so many of you who have supported us through purchases and by helping spread the word. I miss my little Mikey as I remember him through these photos. What a joy he was. He really taught us the love of a pet. If it weren’t for Mikey, we wouldn’t have Charlie, and we would have missed out on so much joy and love. So here’s the first post (again), and if you wouldn’t mind indulging me……. would you share with me what your favorite posts are? Is it the recipes? Is it the photography? 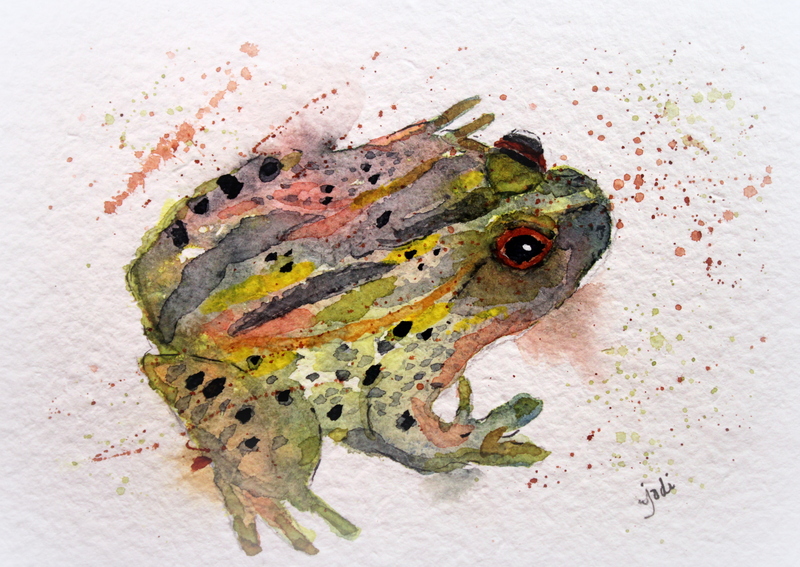 Is it the “art” (watercolor, cards), is it the poetry or writing, family stories, crafts? Should I narrow it to just one of them? Or should I continue this crazy, scattered, who knows what you are going to see tomorrow “lifestyle” blog? the first post – so how do I begin? Or maybe she just thinks I would enjoy doing it, and that is enough. You know…. that’s one of the perks of growing – err – older and wiser – you get to the point where you realize you can do things just because you want to. Yes – there are those things most of us HAVE to do – like paying bills, doing laundry, working – you get the gist – but what do you like to do in between all that? That’s the real “living” part. The main reason I titled this blog with it is because I want to share the things I choose to do in between the things I “have” to do. It can also be a stage of life that is in between stages – and aren’t they all?! So anyway – the things I love to do “in between” the things I have to do – that’s what I want to share with you here. I love to bake. I love how it makes the house smell. I love how it makes people feel when they bite into a buttery, chocolately, caramely yummy thing. I love surprising someone with a special treat of something they love. Here is a picture of my first attempt at French Macarons. I was so excited these testy little buggers turned out. Not sure I’ll ever make them again – so much work – so temperamental – and what if they don’t turn out the next time? Was it beginner’s luck? I’ll just believe I’ve MASTERED them…. and leave it at that…. My ultimate goal (in decorating) is to create a place that is warm and welcoming. A place where someone can just drop by (no formal invitations needed around here) and feel comfortable and welcomed and loved. No shoes off in my house. So what if the carpet has stains… Those stains represent someone who I shared my home with or that spilled a drink or our dog who came in after a rainy spring day – so what… I grew up in a house that was House and Garden perfect… that meant NO SHOES inside… it meant that you could see sweeper marks in the carpet from the daily vacuum…. it meant that you could literally eat off the garage floor if you were so inclined because it was so clean…. and that’s all good… Mom was an awesome “cleaner”… but it’s not me. I want comfort, warmth, welcoming. I want my house to feel like your favorite worn slippers or most comfortable fleece hoodie or your “go to” black yoga pants. That’s what trips my trigger. Here’s a little peek at our home – and that’s my little buddy “Mikey” who is never far from my side. After this LONG COLD winter, it was so nice to see the daffodils and grass recently. And then – I love to photograph it all. Dear hubby got me my first good camera for Christmas this year – and I think he might regret it…. I know my boys do…. but I just love taking photographs of crazy, silly, normal, everyday things. Not a trained professional by any means – not even a class – haven’t even read the whole manual (sorry Patty – I will get there!) – just have fun with it and love seeing what it captures. My BFF, Jill, honored me with the privilege of capturing her daughter, Jackie’s bridal shower recently – oh what fun that was – and even allowed me to do a “photo shoot” with her in-laws (I think George and Alice are going to be more famous than all of us) for a work campaign. Recently, while Marty (that’s the dear hubby’s name) was cutting grass, I was doing very important things like taking pictures of dandelions and bees on them…. and HE snapped this little gem with his phone while on the tractor…. Not flattering – but yep – that about sums it up. 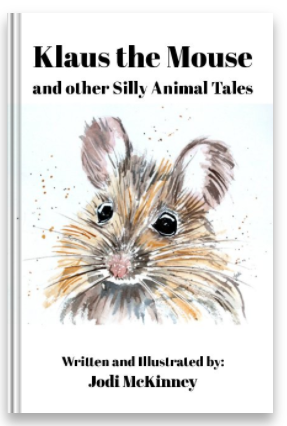 The silly things I do in my life in between….. So we’ll see how this goes…. I now have my first post under my belt. And now I have #692 under my belt…. A few days ago, our little corner of the world was covered in snow and ice. This weekend, however, the temperatures rose to near 60 degrees and the sun shone brightly. It was a little crazy for mid-February when we typically experience some of our coldest, snowiest weather, but we sure enjoyed it. On Sunday morning, Charlie and I took a nice four-mile walk with our buddy, Tracy. We visited Kitty, and we splashed through some puddles of melted snow and ice. After breakfast and a few chores, I spent a relaxing afternoon splashing paint at the kitchen table with the sun streaming in. 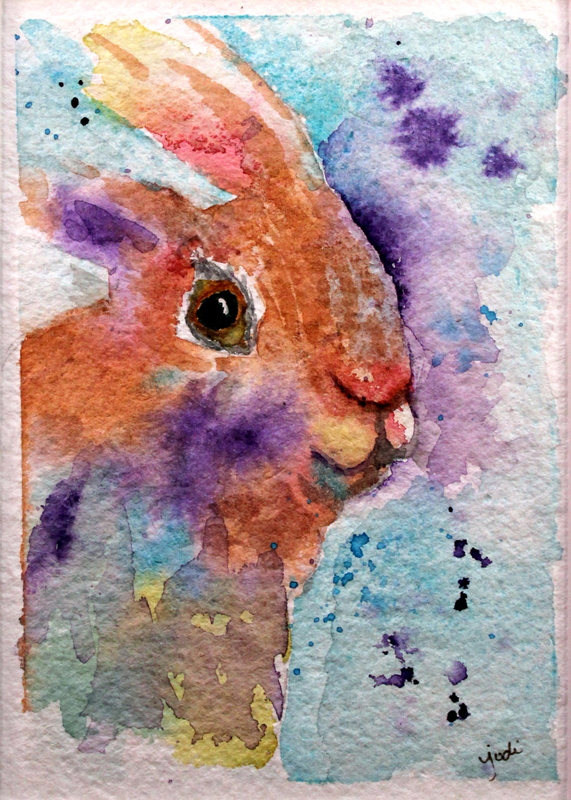 I painted this bunny that reminds me of Spring and Easter and babies and renewal. I painted another fun little piece that will be a gift for an upcoming baby shower, and a couple other things before packing up the paint and making dinner. What a great way to spend a day. Thinking Spring. Enjoying warmth and sunshine. Doing the things I love…. I had the good fortune of being invited to visit with this adorable family yesterday and taking a few photos. Sweet little Baby Dean is only a month old. His handsome Big Brother Luke is 3. They just so happen to be my amazing Daughter-in-Law, Colleen’s, nephews. Sure reminded me of what seemed like just a blink and a half ago when my two boys were about the same age. 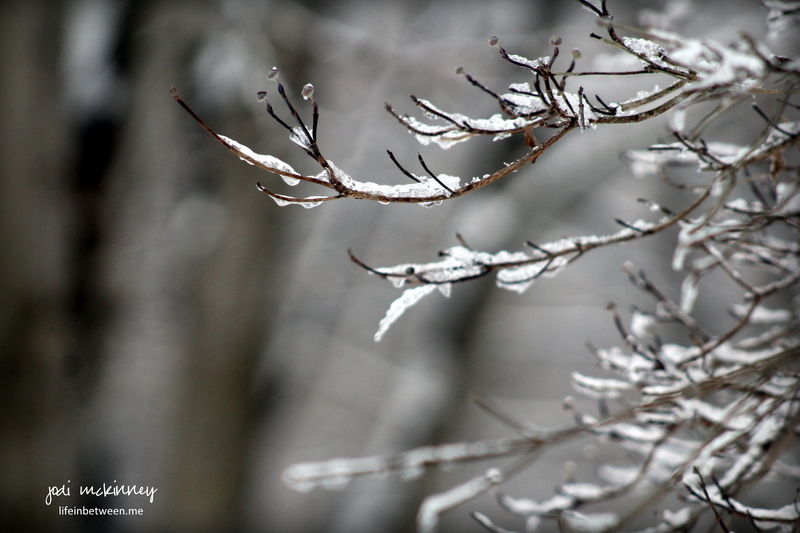 Don’t blink – ‘cuz just like that…..
and weight of frozen snow. and you withstand the torture. and bear fruit and flowers. You provide beauty and nourishment and shelter. and you welcome the chill. And the cycle of seasons starts over again.